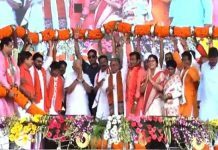 Prime Minister Narendra Modi with other BJP leaders at the Durgapur rally on Saturday. 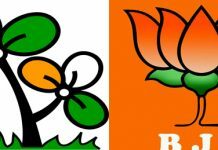 Asansol: Earlier this week, BJP president Amit Shah claimed that within minutes of the upcoming Lok Sabha election results, Trinamool government in Bengal will trip. The proposition has now been strengthened further by none other than Prime Minister Narendra Modi. In a public rally at Durgapur this afternoon, the PM said that the ouster of Mamata Banerjee government from Bengal’s power is certain. He, however, didn’t elaborate how this is possible as the next Assembly election in Bengal is due in 2021. At Durgapur was the PM’s second rally in the state today. He addressed the first rally at Thakurnagar in North 24-Parganas. In his speech at Durgapur, Modi mostly focused on the alleged corruption in Trinamool, especially by Mamata Banerjee, and the alleged anti-democratic functioning of her government. “Be it chit-funds, Saradha (Scam) or paintings, every thread is leading to one single door…This is why they are even stopping investigation agencies from entering Bengal. 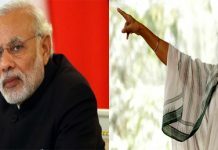 Didi, if you haven’t done any wrong, why are you so scared,” the PM asked targeting the Trinamool supremo and Bengal Chief Minister. Modi said that during the UPA government at Centre, he was questioned by CBI for nine hours in Gujarat. Yet, his state government never hindered the functioning of the CBI. 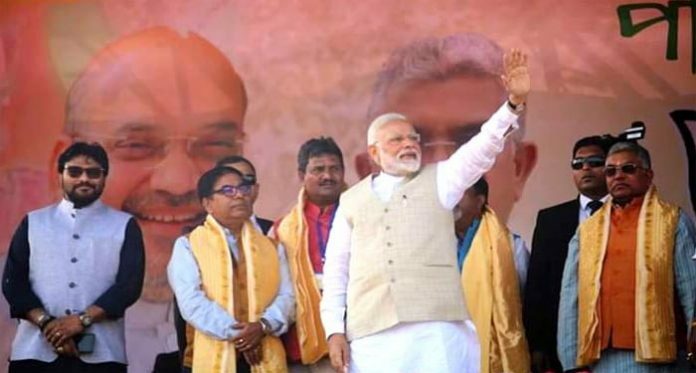 The PM maintained that Trinamool is so scared at the tirade of his government that it tries to scuttle the visit of BJP president by denying permission for helicopters to land or not allowing Rath Yatra to happen. “The government, which does not care for democratic norms, whose party cadres have a free licence to indulge in violence and, the way government staff are behaving: mark my words: the departure of this government is certain. Bengal will usher in a change, I can see this clearly,” the PM said.